Have you ever bought a pair of shoes online only to be followed by that shoe for many months afterward? This is the challenge with personalization today. 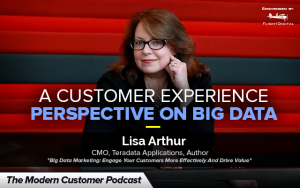 According to Lisa Arthur, CMO of Teradata Applications, personalization is not making the cut. Personalization hasn’t delivered relevance and hasn’t given marketers a better approach. What’s supposed to be personalized is still mass marketing; and with that comes mass customer experiences. Fragmented customer experiences have made it challenging for customer experience professionals looking to leverage big data. Companies today need to tear down silos and untangle that data hairball—for the sake of customer experience. In this podcast we not only address the plight of modern day customer service but we also talk about how recent data breaches have changed attitudes about privacy.